Liptov region - The Tatra Mountains; in district town "Liptovsky Mikulas", on quiet place 800 meters from the centrum of Liptovsky Mikulas. 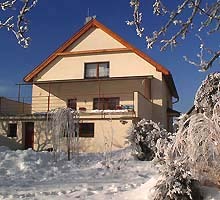 Two apartments & two rooms with kitchens in private cottage with separate entry; electric heating; off-street safety car parking; garden with playing field for children - kids are welcome; Check In time (arrival) is between 14:00 - 21:00 hours; Check Out time (departure) is before 10:00 am; night silent between 22:00 - 07:00 hours; ▽ Price list ▽. Two bedrooms for 2+2 person, living room with fully equipped kitchen and dinning place + TV, big bathroom with shower and WC, (2nd floor). Two bedrooms for 2+3 person, living room with fully equipped kitchen and dinning place + TV, big bathroom with shower and WC (2nd floor) . Room for 3 person with TV and bathroom with shower and WC; there is 1 kitchen with dinning place for rooms "C" and "D" (Ground floor). Self catering (individual) - the kitchens are fully equipped (electric cooker, microvawe oven, electric kettle and fridge/freezer). You can visit many restaurants and pubs 7-12 minutes walking in the centre; the nearest groceries (nonstop) - 250 meters; the nearest supermarket "LIDL" - 300 meters. Liptov region (429-2494 m) is indeed a tourist paradise. All nature fans will find here ideal possibilities for the rest of sports. The abundance of natural attractiveness, cultural and historical monuments and folk traditions present in all forms of expression act as a magnet of tourists. When bad weather comes you can visit the numerous museums or galleries. Liptov is attractive and interesting all over the year. The ideal location of the "IRIS" house makes it excellent starting point for tourism. Travelers arriving at our accommodation get all tourist information, they would like to have. We are at disposal of guests for answering any question, regarding the life in Liptov region, attractions, excursions, shopping, discotheques etc. We also give general, useful advice based on the experiences of other tourists previously lodged at us.